The Library of Congress just released its 181 page report “The State of Recorded Sound Preservation in the United States: A National Legacy at Risk in the Digital Age” talking about the challenges of digitally archiving sound recording. BoingBoing gives a nice summary “[T]he copyright laws that the recording industry demanded are so onerous that libraries inevitably have to choose whether to be law-breakers or whether to abandon their duty to preserve and archive audio.” More analysis from OSNews. And if anyone’s wondering where I’ve been this week, the answer is “Mired in getting copyright permissions for the intellectual property in my book. Thanks for asking.” I have a pretty firm grasp of Fair Use and have been trying to follow the guidelines for Fair Use in Media Literacy Education. I signed a book contract that specifically says that I am responsible for assuring that my materials are being used with permission. Despite this, my publisher (who I am quite fond of otherwise) is risk-averse and wants to make sure I have permission anyhow. Permission that I assert that I don’t need for small screenshots of, say, Google search results or an ALA nested menu. This gets even more confusing when some of the organizations involved claim that I need permission when I don’t. 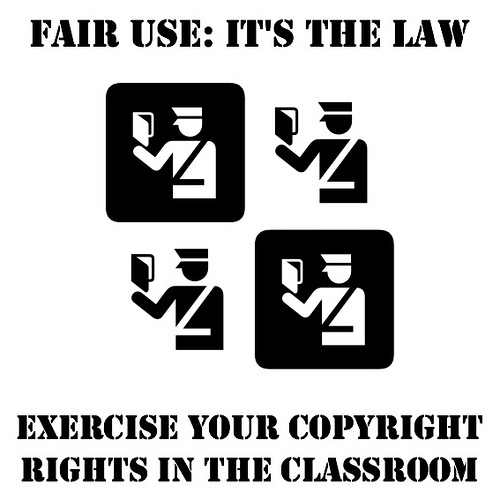 Since Fair Use, like the Americans with Disabilities Act, is mostly something that gets hammered out through litigation there is no strict set of guidelines as to what Fair Use is. So, big companies with a lot to lose err on the side of compliance with other big companies’ requests, requests that may be extralegal. So Google can’t legally tell you to only use the public domain offerings from Google Books (which they admit) but they make a polite request, a polite request that sounds a lot like a terms of service. So right now I’m waiting to hear back from Facebook after filling out a form on their website asking for permission to use a screenshot. They say it will take 1-2 weeks. I am confident that my screenshot is fair use. My editor also thinks it is fair use. However they’re not willing to risk it. And so we wait. I know what you are talking about. I have a small net-magazine and I write on underground bands; those that generally reach out to small audiences and receive therefore little if any attention. It is released under the CC-license and the more I dug into the legal code and all the stuff that goes along with copyright and s###, I realized that it is impossible for me to use cover artworks and any other type of ‘modern’ or nowadays stuff, because I would need to get a permission from the band or the artist in order to add it to my magazine. The amount of time and energy that are necessary to get these stand in a huge contrast to the gains. So I decided to add stuff that has no copyright anymore: pictures of books that are nearly 100 years old. Todays’s copyright prevents artists to create something new … it should go down the drain, as the sole profiteer seem to be the big cooperations. I had a young adult novel that had a publisher interested, but they passed because the characters made too many references to pop songs, and they believed the clearances would be too difficult. So a lot of our culture is being shut down and locked up without resulting in any additional exposure, work or payment to original artists. I was listening to Mike Wesch give a short talk on fair use yesterday, and he made the simple and elegant point that fair use is actually not a legal gray area, but an area that has been made concrete by the work of various institutes and organizations, culminating the creation of numerous best practice documents. Most librarians know this intuitively, but are pushed back as you have been in this case. The best practices give us a better leg to stand on. Sure, they are legal interpretations, not law, but grounded in a close reading of policy. Too bad your publisher is so risk averse. There isn’t a court in the land that would listen to Facebook or Google for five seconds if they complained about someone using a screenshot. For heaven’s sake, it is defensible under all four fair use factors, and not even a close call. You know this, of course, which surely just adds to your frustration with your publisher. The best practices were sort of some light at the end of the tunnel, so I thought I’d share that.